Rated "Best Buy" by Cornell Laboratory of Ornithology, Better View Desired, and the English publication, British Birds. Equipped with a 5-lens ocular system, BaK4 prisms, fully multi-coated optics and pop and lock eyecups adding comfort for eyeglass wearers. The Swift Audubon produces crisp, high definition images to the outer edges of the wide field and close focuses to under 10 ft. 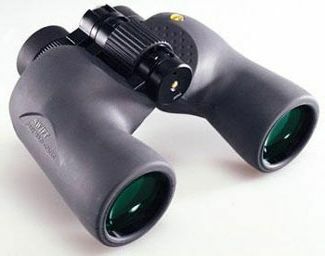 The rubber-coated body is made of magnesium to reduce weight and is sealed to make the binoculars waterproof. Added to the patented features and world-renowned optical formula is an ED (Extra low Dispersion) lens. ED Glass provides exceptional, precise color definition, while promoting optimum resolution and sharpest possible images. It even further expands the viewing capabilities of fine optics. Complete with a neoprene neck strap, ocular objective lens covers, microfiber lens cloth and hard leather storage case.